Download the Andy Wing Exhibition Checklist. As the Getty Foundation's regional initiative Pacific Standard Time: Art in L.A., 1945-1980 commences, Art Resource Group, a participating gallery, is proud to contribute to the celebration of the birth of the Southern California art scene by presenting an exhibition of paintings and sculptures spanning three decades of the career of Laguna Beach artist Andrew "Andy" Staley Wing (1931-2004). Wing's works demonstrate the unique influence of the Southern California art scene and physical environs on a young East Coast painter who earned his MFA at Cal State Long Beach and subsequently contributed significantly to the advancement of modern art in this region. In addition to the Exhibition, Art Resouce Group has also launched a special site dedicated to Andy Wing, including a detailed chronology of the artist's life, an online gallery of Andy Wing's artwork, and video clips, images, and text giving valuable insight into the artist and his methods. Read our complete Andy Wing Press Release here. Learn more about Pacific Standard Time and the participating galleries here. ← Video clip of Andy Wing by Susan Sherman of SVC, International produced for PBS in 1987. As with most art made in Southern California over the last half of the twentieth century, the multidimensional work of Andrew Staley Wing defies simple categorization. It wasn't about Hollywood and it wasn't part of "The Cool School," or "The L.A. Look," as defined by art critics and historians, particularly New York-based writers starting in the 1960s and 1970s. Unique in its vision and execution and created in Laguna Beach-a community somewhat isolated from the Los Angeles art scene-Wing's work is outside of the clichéd definition of a Los Angeles art sensibility. Derived from Abstract Expressionism, it challenges and broadens the established constructs of metaphysical angst with its vistas of surface, light and color, while incorporating the total involvement of body and spirit. 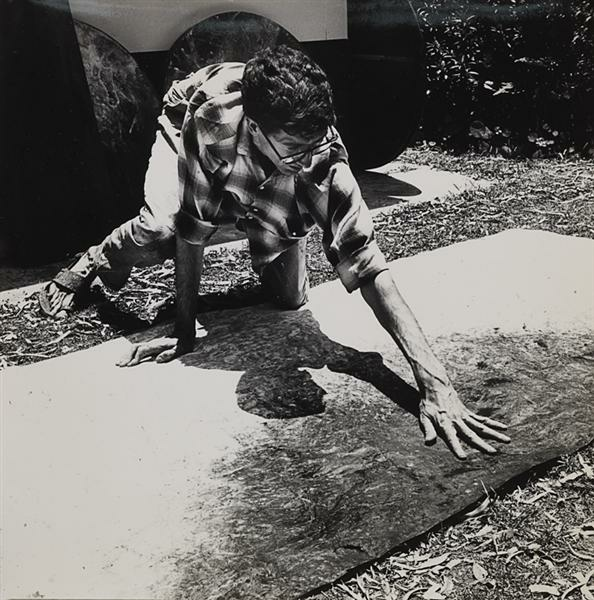 It is about material and process: it is also anti-illusionistic, and very much about the outdoor environment in which it was created, which sets it apart from other work being made in California at that time. As a California artist, Wing started by making his work in the backyard outdoor "studio" of his Laguna Canyon home, nestled under a grove of eucalyptus trees. 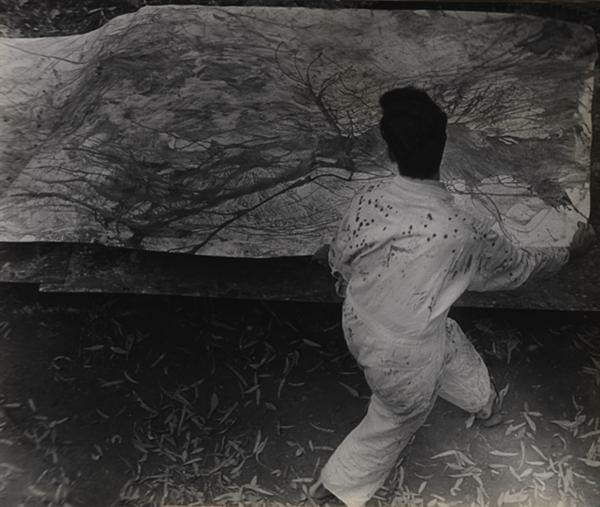 In an overarching series that he titled Environmental Paintings and Murals (1959-1986), Wing made paintings without using a brush, in an interpretative, rather than representational or scenic, approach. He investigated a variety of approaches to his work, incorporating the newest painting techniques and scientific innovations into the use of plastics, resulting in an introduction to a new spectrum of synthetically produced color. Although not similar in appearance to the sculpture of the California "Finish Fetish" artists like Larry Bell, John McCracken, and Craig Kauffman - who used non-traditional art materials such as glass, plastic, and polyurethane resin - Wing's work does share an interest in the semi-transparency of the "miracle" plastics of the '60s, and the visual oscillation of the soft and fierce light particular to Southern California. As involved as he was with the chemistry of paint and its technical process, and as much as he enjoyed writing and talking about it, Wing felt that over-conceptualizing, explaining, and theorizing was antithetical to the creative process. He believed in the "delicacy of accident" and that "painting is of the spirit." His experiments resulted in a substantial body of work that is brilliant in both color and theory. Wing played with the notions of negative/positive and abstraction/representation to create art that is at once contemplative, vibrant, and innovative. Throughout his career, he struck a powerful and playful balance between art and object. Wing engaged those drawn to the sheer beauty of his works in a revelatory dialogue about the still-relevant concepts of conservation and excess, nature and the surreal, consciousness and transformation.